Man credited with saving the New York Philharmonic orchestra dies, aged 88. He had been battling Parkinson's Disease. The New York Philharmonic orchestra itself made the announcement of Kurt Masur's death, saying he’d created a golden age for the institution. Masur was born in 1927 in Brieg, Lower Silesia, Germany (now part of Poland). In 1970 he became Kapellmeister of the Gewandhausorchester in Leipzig, East Germany, and served in that post until 1986. In the lead up to the fall of communism in East Germany, Masur was credited with using his influence to prevent a bloody crackdown on protesters. He conducted a performance of Beethoven's Ninth Symphony to celebrate Germany's reunification in 1990. When Masur took the helm of the New York Philharmonic in 1991, the orchestra was in a dire straits. Its recording contracts were hanging by a thread, its musicians discontent and its audiences underwhelmed. For the next decade, the conductor put the NY Phil back on the road to global success. Matthew VanBesien, president of the New York Philharmonic, said: "Maestro Masur’s 11-year tenure, one of the longest in the Philharmonic’s history, both set a standard and left a legacy that lives on today. “What we remember most vividly is Masur’s profound belief in music as an expression of humanism. We felt this powerfully in the wake of 9/11, when he led the Philharmonic in a moving performance of Brahms’s Ein Deutsches Requiem, and musicians from the Orchestra gave free chamber concerts around Ground Zero. "Today, New Yorkers still experience this humanist mark through the popular Annual Free Memorial Day Concert, which he introduced." 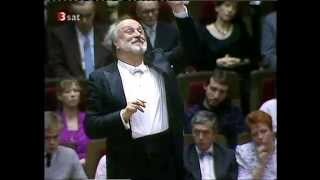 Between 2000-2007, Masur served as principal conductor of the London Philharmonic Orchestra. In 2012, Masur revealed that he had been suffering from Parkinson's Disease. He died in Greenwich Connecticut today. He is survived by his third wife Tomoko and five children.